Lovested brake staff bracket, chain spool, and “B” end carrier iron from FMW-2201e installed on assembled FMW-2201 kit. 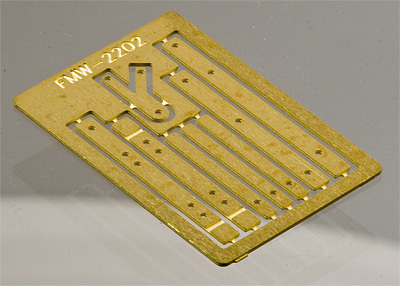 Various etchings from FMW-2201e installed on assembled FMW-2201 kit. Originally part of our WSLCo. 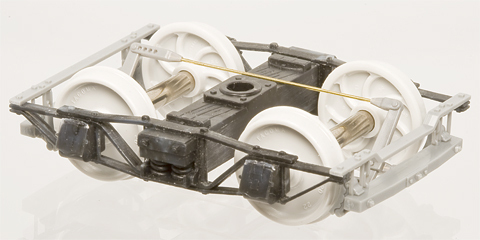 24′ Hammond Flat Car Kit (FMW-2201), these parts are now offered separately for scratch-builders and for those looking to finish Carter Brothers/Hammond flat car kits produced by earlier manufacturers. 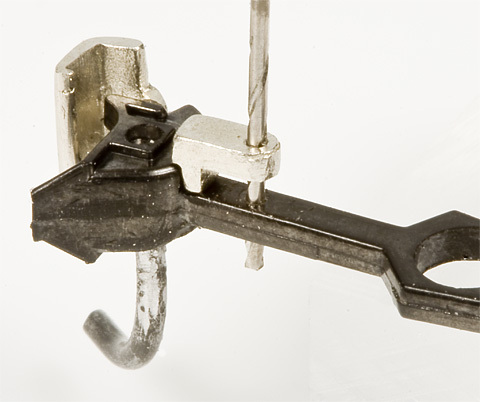 Of note are the chain spool/ratchet & pawl casting and the upper brake staff bracket, which were produced using data and drawings from a vintage Lovsted catalog (supplier of many of the castings used by the WSLCo.). The log chain mounting plates fit 5″×12″ (0.1042″×0.1458″) side sills. 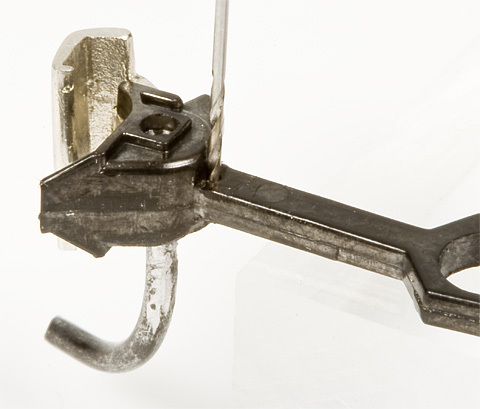 The “A” end carrier iron fits 18″ (0.375″) wide (over outside) draft gear. Fold lines etched in for easy assembly. Far stronger than paper cutouts! Cast, white metal Lovsted catalog chain spool w/ratchet & pawl. 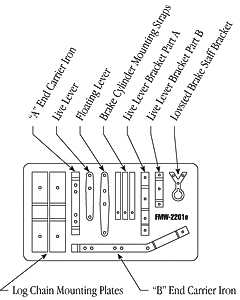 Easy to follow, illustrated instructions by FMW. 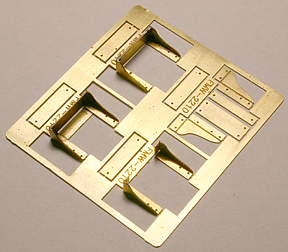 This kit includes all the brass etchings and castings shown above. Upper brake staff bracket and “B” end carrier iron from FMW-2202e installed on assembled Design-Tech DT-114, 18′ High Side Gondola kit. Upper brake staff bracket and “B” end carrier iron from FMW-2202e installed on assembled, urethane, FMW-2222 20′ Sand & Gravel Car kit. 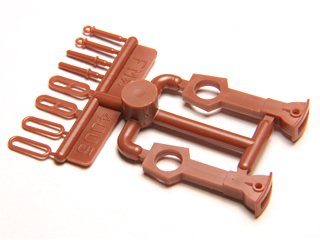 Car is also equipped with FMW-4005 Link & Pin couplers. Originally part of our WSLCo. 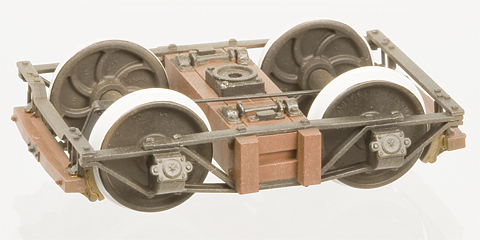 Standard 24′ Flat Car Kit (FMW-2202), these parts are now offered separately for scratch-builders and for those looking to finish WSLCo. 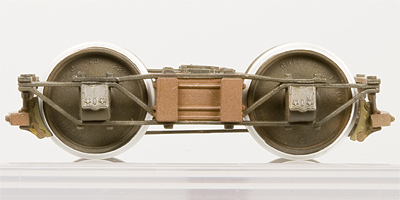 flat car kits produced by earlier manufacturers. The “A” end carrier iron fits 20″ (0.4167″) wide (over outside) draft gear. 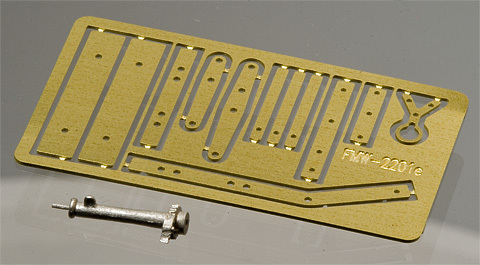 This kit includes all the brass etchings shown above. FMW-2210a Caboose Steps assembled and installed on completed, Simpson, West Side Lumber, First Caboose 3, as built, c1942 kit. FMW-2210a Caboose Steps assembled and installed on completed, FMW-2210 WSLCo. Short Caboose #3 kit. Originally offered as a part of our WSLCo. Short Caboose kit FMW-2210, they are also offered here separately. 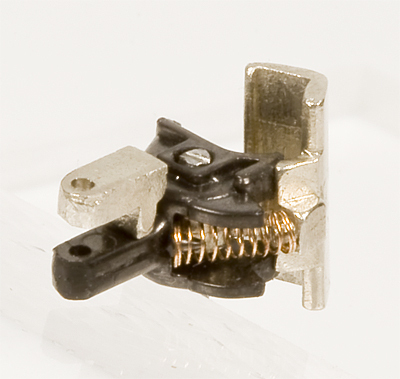 Whether we’re replacing the “paper cut-out” steps of a previously manufactured kit or just adding them to the vulnerable corners of a new model, the half-hard brass construction adds the necessary strength. 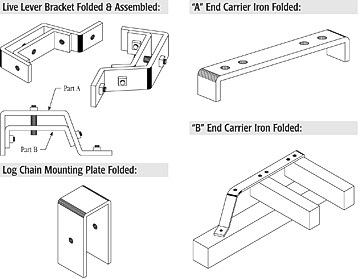 And the illustrated instructions and built-in assembly jig make assembly a snap. 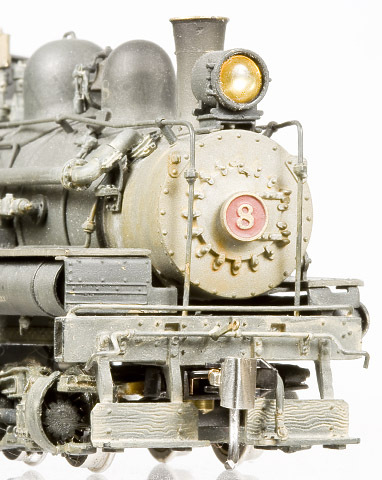 These beautiful, precise steps make a great addition to any model caboose project. Can be soldered or glued together. 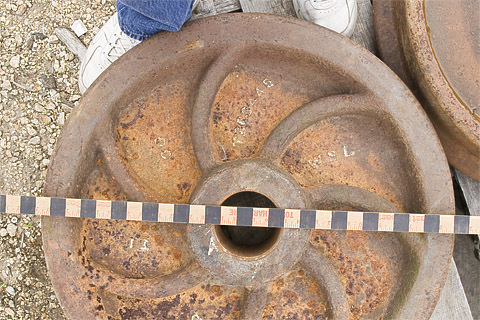 Two different sizes of kick plates. 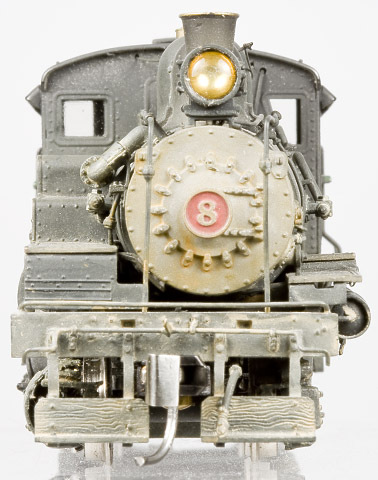 This kit includes all the etchings and castings required to complete four short caboose steps. Adds that finishing touch that makes all the difference! 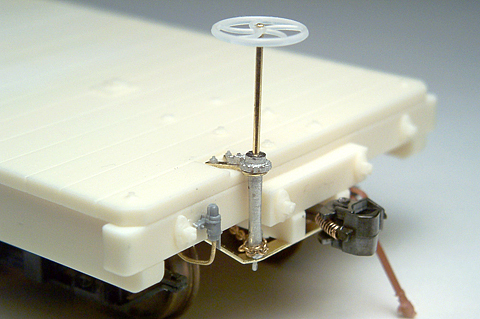 Installed on T-3 trucks and used on a completed FMW-2201 kit. Installed on MacLeod Western T-3 truck. Installed on MacLeod Western T-12 truck. Installed on MacLeod Western T-14 truck. Installed on MacLeod Western T-16 truck. Installed on MacLeod Western T-17-2 truck. Installed on MacLeod Western T-18-2 truck. 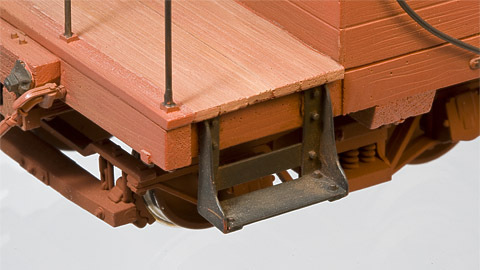 The first part in Foothill Model Works’ transition to styrene injection molded kits is this set of wooden brake beams. Based on measurements of a WSLCo. 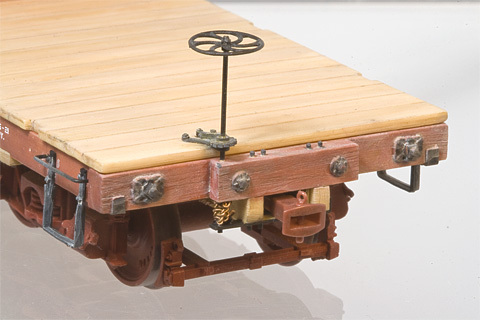 Camp Niagra camp car’s wooden brake beam, this incredible accurate, highly detailed part fills in one of the last remaining missing detail parts of a West Coast arch bar truck - the brake beams. The detail has to be seen to be believed, in fact, you might even need a magnifying glass (Check out the Cotter Pin holding the brake shoe mounting rod in place)! 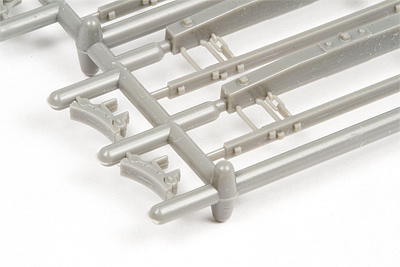 Rest assured though, their styrene construction means they’re durable enough for day to day operations on your layout. One look and we’re sure you’ll agree, you won't be satisfied without them anymore! Want to use them in On30? Just use our special On30b, On30 wheel sets on On3 length axles and no one will know the difference! 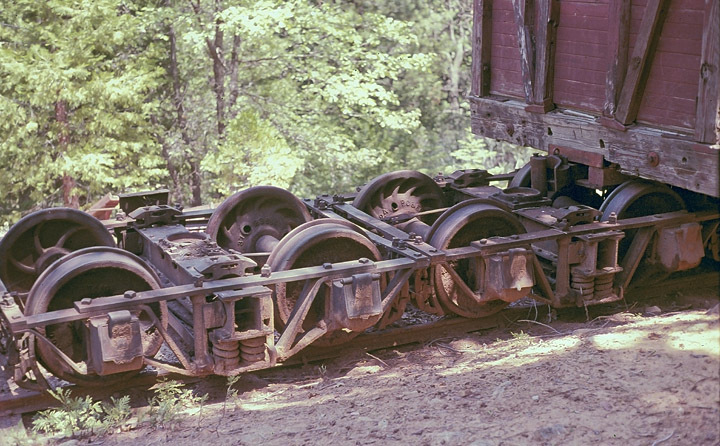 (T-12 with On3 bolster and FMW-4011-On30b 26″ wheels on the left; T-11 with On3 bolster and FMW-4011-On3 26″ wheels on the right. 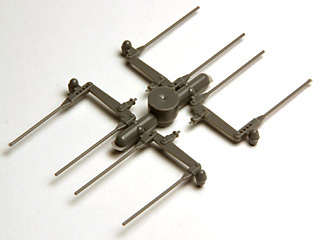 Made of easy to assemble and paint styrene. Suitable for several railroads, including the WSLCo., SPC, NPC and many other western railroads. Fits a number of different MacLeod Western and Simpson trucks. Easy to follow, photographic instructions by FMW. 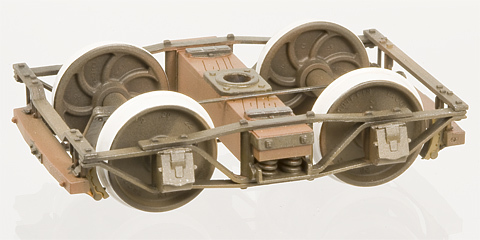 This set of castings includes all the styrene castings required to complete one set of brake beams for one pair of trucks (trucks, wheels, car kit, brake levers, glue, and paint not included). 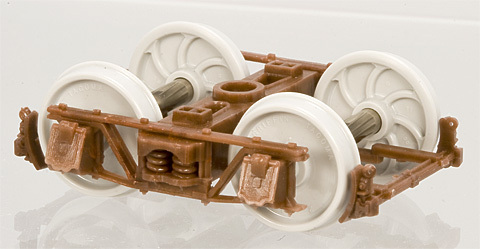 Our first 2005 addition to our growing line of O scale, plastic detail parts (cast in Celcon® for strength); this brake wheel is a copy of an ACME 15″ brake wheel (part #17781) from the Roots of Motive Power collection in Willits, CA. The ratchet comes from drawings of a common ratchet from a Lovsted catalog. 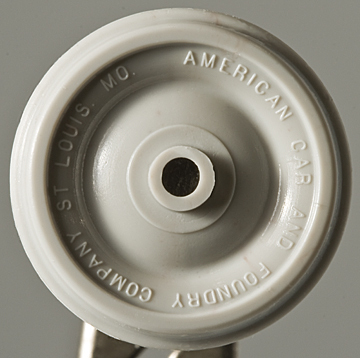 The pawl is a copy of one used on one of the WSLCo.’s camp cars. 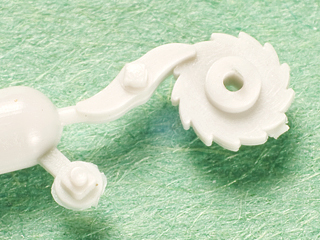 The parts are cast with a 0.0201″ hole, but can easily be drilled out for a 0.0253″ wire (or 0.0285″ if you’re careful). 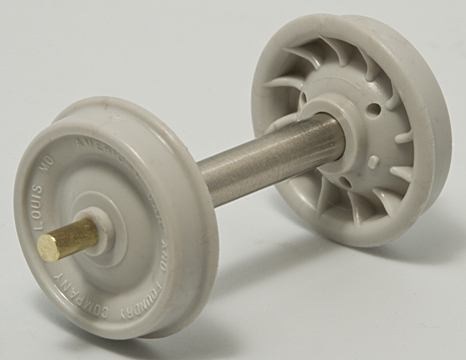 Once installed on your model on the end of the brake staff, a large Nut/Bolt/Washer should used on top of the brake wheel hub. 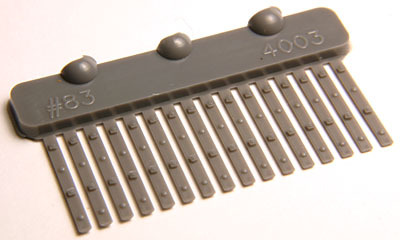 This highly detail part set is suitable for use in any gauge in O scale (O, On3, On30, On2, etc.). This parts set includes one brake wheel and one ratchet & pawl casting. 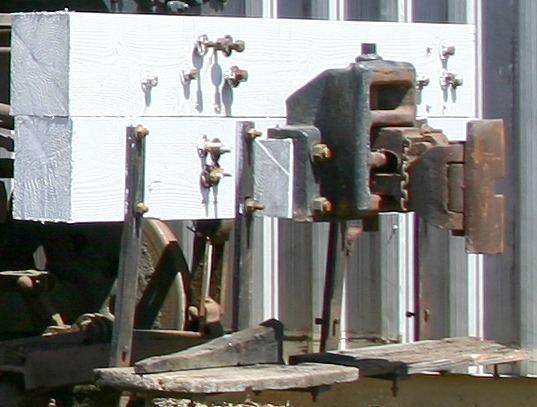 Commonly used on this rail size into the early 20th century in new construction, then common on older or re-laid rail, these flat plates were used to connect rail sections together. This set fits code 70 rail and is meant to be installed in pairs; bolt heads on the inside, nuts on the outside. 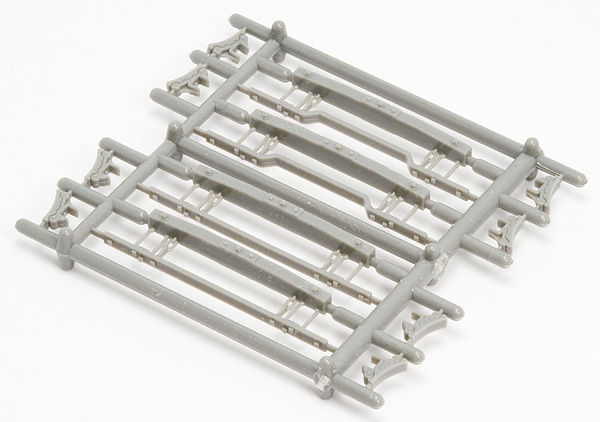 Excellent for use on hand laid rail where extra detail is desired on visible, foreground track. Cosmetic only. 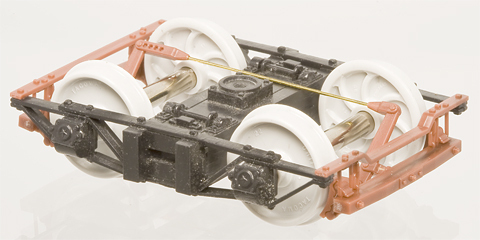 Suitable for use in any gauge in O scale (O, On3, On30, On2, etc.). 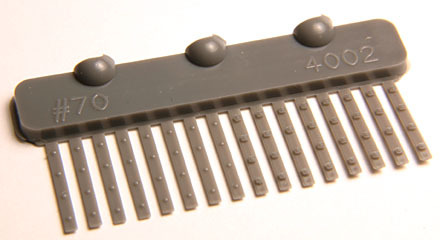 This parts set includes 5 code 70 fishplate sprues, enough to simulate 40 rail joints. 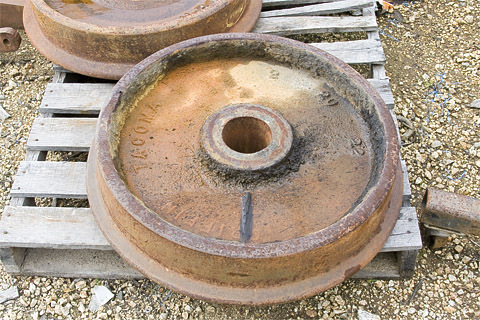 Commonly used on this rail size into the early 20th century in new construction, then common on older or re-laid rail, these flat plates were used to connect rail sections together. This set fits code 83 rail and is meant to be installed in pairs; bolt heads and nuts alternating on the inside and outside. 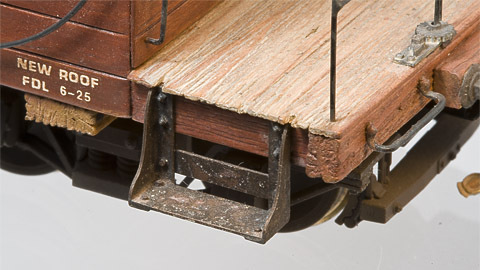 Excellent for use on hand laid rail where extra detail is desired on visible, foreground track. Cosmetic only. 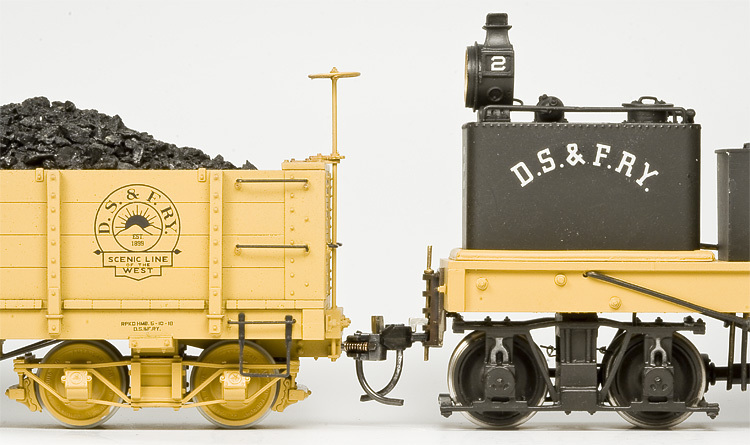 Suitable for use in any gauge in O scale (O, On3, On30, On2, etc.). 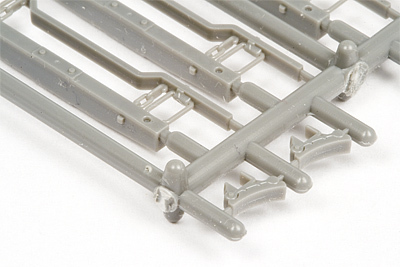 This parts set includes 5 code 83 fishplate sprues, enough to simulate 40 rail joints. 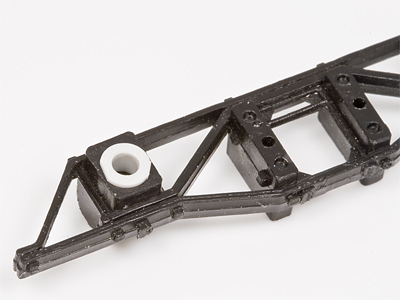 This part set represents the rods and levers that pull the brake beams towards the wheels when the brakes are applied. 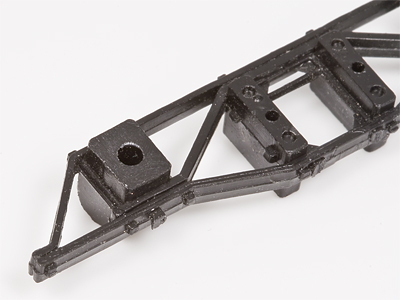 The companions to our On3 Wooden Brake Beams in styrene (FMW-4000), they add that finishing touch to a super-detailed model; especially on cars where the brake system is highly visible (like our NCNGRR box car kit or a skeleton log car). This parts set includes 4 brake levers, enough to complete one pair of trucks. 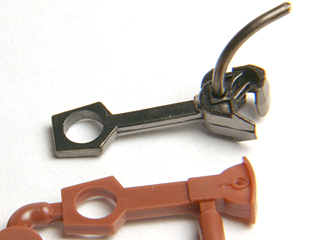 This single set includes 2 link & pin couplers (drawheads), 4 links, and 4 pins. 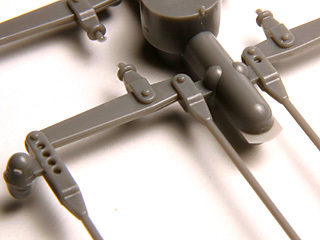 The bulk pack includes 10 sets of these castings. 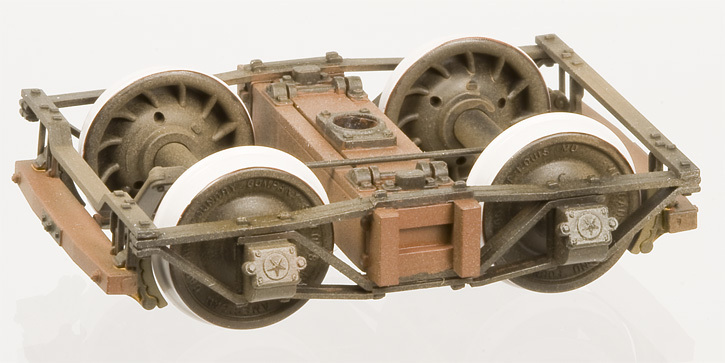 Something new, scale American Car & Foundry, 24″ wheels! 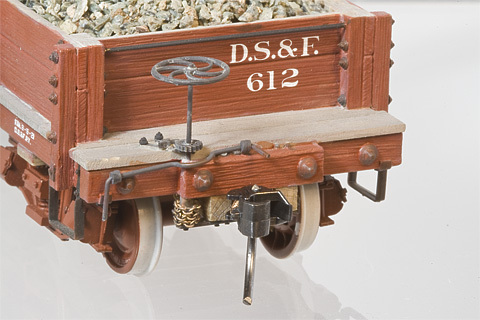 And we do mean scale (O Scale to be exact, gauge to be determined by axle length, just like the real thing). 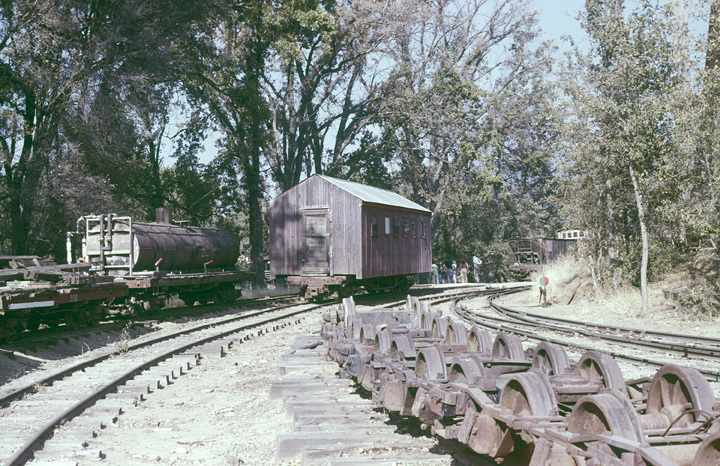 These are very accurate copies of 24″ double plate or “Washburn” pattern, chilled iron wheels used on the Casper, South Fork, & Eastern and Mendocino Lumber Co. disconnects based on exacting measurements of those preserved in the Roots of Motive Power collection in Willits, California. We even cut the wheel tread to an exact match of period M.C.B./A.A.R. recommended practices (no mangling to match RP25 here). 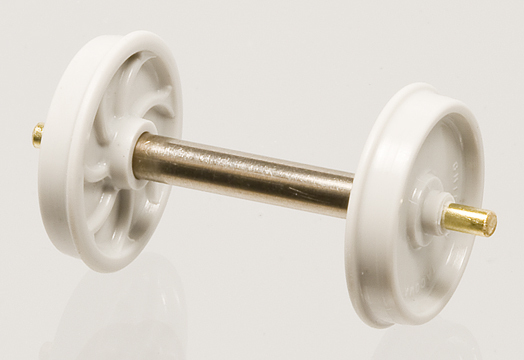 Also note as you look at the photos and read the captions, these wheels are only 0.5″ in diameter (aka the detail really is that small)! Production has begun and the first batch has already shipped! Front and Back of the new wheel. 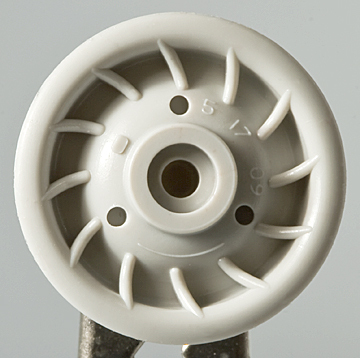 The wheels are shot from the center of the wheel, so there aren’t any nicks in the flange or along the rim. Nor did we use knock out pins. 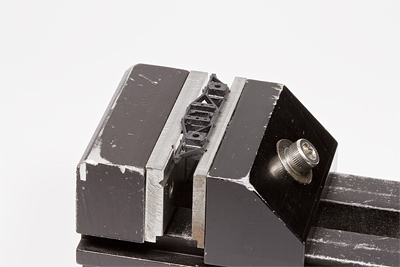 The letters were cut with a 0.003″ diameter end mill for scale 1/8″ thick letters! 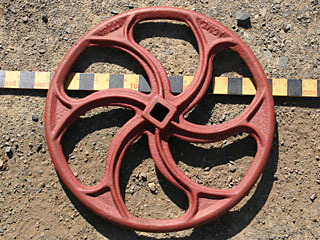 The small rectangle on the back of the wheel is the gate or the place where the sand casting was filled on the prototype (which never seemed to be in the same place twice), the three holes were used to support while casting and drain the sand afterward that formed the hollow (or double plate) of the prototype, see below. Note: the 1/8″ thick arc on the back of the wheels is correct. AC&F didn’t build these disconnects specifically for the C.S.F.&E. or the M.L.Co., they were built as catalog items, hence the dash. Had they been built specifically for the C.S.F.&E. 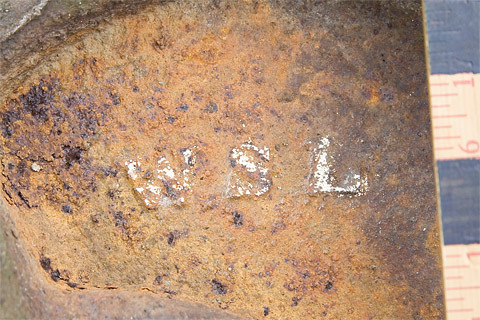 or the M.L.Co., the railroads initials would have appeared here (true for any built to order wheel/car order, no matter how small the railroad - even the NCNGRR’s wheels had their initials on them). A cross sectional view of an early styrene test shot (cutting Celcon® isn’t easy). 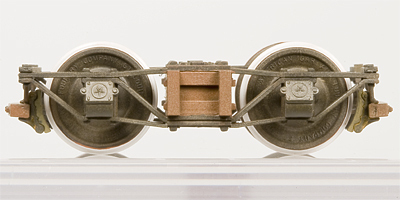 The styrene test shot had some slight warp-age (not present in the final Celcon® part), but does accurately show off the how closely the model follows the contours of the real wheel. 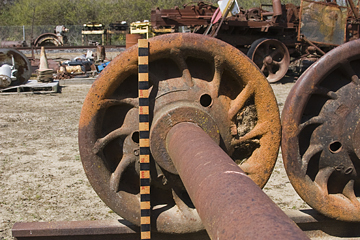 Typical AC&F 24″ wheels being measured and photographed at Roots of Motive Power, Willits, CA. 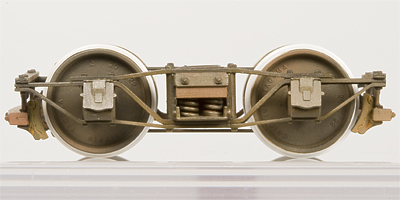 Note the build-up of “stuff” of the face of the wheels on the left. Sometimes a lot of die cutting work will get lost in the real world. We have long been huge fans of MacLeod Western’s line of trucks and detail parts. Without them, we would be stuck in a world of really expensive, brass trucks and/or an unending supply of “yet another pair of Delrin™ D&RGW arch bar trucks.” Great if you’re a D&RGW or RGS modeler, but a pain for everyone else. Especially us, “West Coast” modelers! But, being made from styrene they have both good and bad qualities. 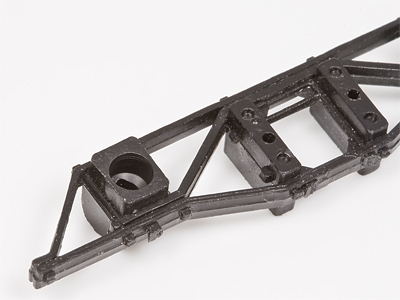 The Good: They hold paint extremely well and you can easily modify them and add additional details (like our Brake Beams, FMW-4000, and the additional side bearings on our 26′ Connected Truck Log Car kits, FMW-2215). The Bad: Styrene isn’t a very good bearing material. You’ve probably noticed a squeal after long periods of running or under heavy loads. Not to mention the drag this puts on the car’s rolling resistance. With problem getting steadily worse as powdered styrene builds up in the journals. The quick and dirty fix: lubricating the journals. A good, plastic compatible oil can help, but the oil can effect the paint. Packing the journals with graphite works well too. Unfortunately, neither solution is permanent and will have to be redone from time to time. The more permanent solution: a bearing insert. Those of you who remember Russ Simpon’s West Side Lumber Co. trucks (which were also styrene) will remember that he used half of a brass rivet as a bearing insert. This worked well, but still needed oil for the brass-on-brass wearing surface and finding a reliable supply in the days of Chinese manufacturing is, well, “problematic.” So, we decided to make our own bearing inserts cast out of the same long wearing, Celcon® material we make our wheels out of. The result: Beautifully free-rolling truck without squeaks or the need for oil! A friendly word of warning: While modifying MacLeod Western’s trucks for these bearing inserts is not especially difficult, it does require some specialized tools and does have the risk of breaking the sideframes. Proceed at your own risk as we will not replace parts damaged while following these instructions! A 7/64″ (0.1094″) Drill Bit. A good one (aka NOT from Wal�Mart or Harbor Freight). Unfortunately, most drill bits are made for drilling into steel or wood, and are, therefore, WAY too aggressive. 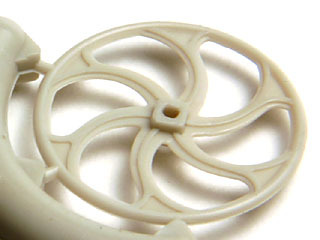 The helical angles and rake angles are too high for plastic. In short, they will snag in the first 1/4 turn and rip the sideframe apart. If you have a good 7/64″ drill bit that cuts a straight, true hole, you can grind the rake angle on the tip to a flat, 0°. So the tip will scrape, rather than cut like a chisel. I started off with a D-bit cutter I ground myself with the same rake angle. If your name isn't Scott Kitts, the simplest solution is to just buy a good straight-flute drill bit. 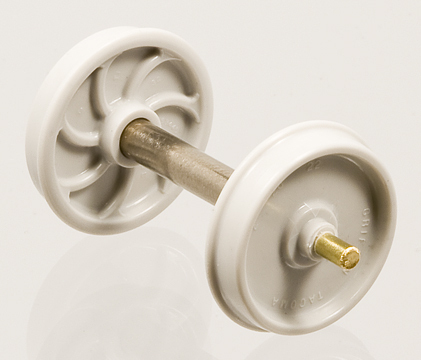 McMaster-Carr has one for $11.19 (part No. 8944A14). Standard twist drill with hand-ground, zero-degree rake angle (along edge indicated by arrow) for scraping. Courtesy a machinist friend. Hand made, D-Bit drill bit. A Drill Press. One with a good chuck and that you can control the speed of. One of those contraptions that converts a Dremel Tool into a drill press would NOT be a good idea here (its 5,000 to 35,000rpms WILL turn your sideframe into a puddle of goo). You’re looking for around 200-300rpm. We use a Cameron Micro Drill Press Series 164 with a speed control (Variable Speed Control Model 2A), an Albrecht chuck (0-1/8″), and a dial indicator depth gauge (we used one from Harbor Freight). A small milling machine like a Sherline or a Unimat would also work. I can’t see a pin vise working well here. 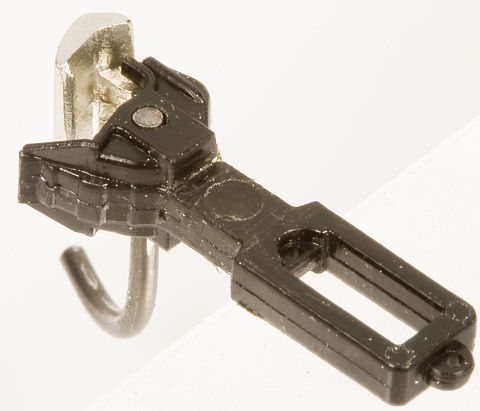 A Jig or Clamp. 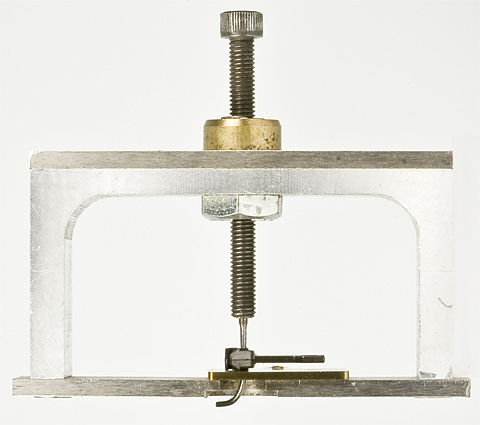 A jig can be something as simple as a plate with a hole in it. Basically, you’re looking to hold the sideframe flat, securely. Random junk plate with holes in it as a jig. With “ultra-safe” finger clamp. Sideframe held in Sherline vise. Sideframe may need to be shimmed to get secure hold. Use the slowest RPM possible (around 200-300rpm) and peck at hole. Plastic and heat don't mix! 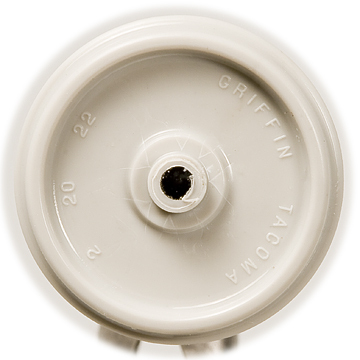 Drill so that the full diameter of the hole is at least 0.070″ deep. 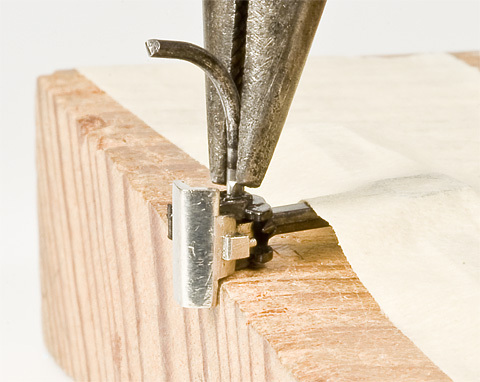 Use the stop on your drill press or a drill bit collar. Test drill in a scrap piece of plastic first and check the fit of the bearing insert. If the insert is loose in the hole, try rotating your drill bit 90° relative to the chuck (which may be out of round; especially if it’s a cheap, Jacobs chuck). You can also try a 2.75mm instead of a 7/64″ drill bit. Cyanoacrylate adhesive will also work on a good, but not press, fit. 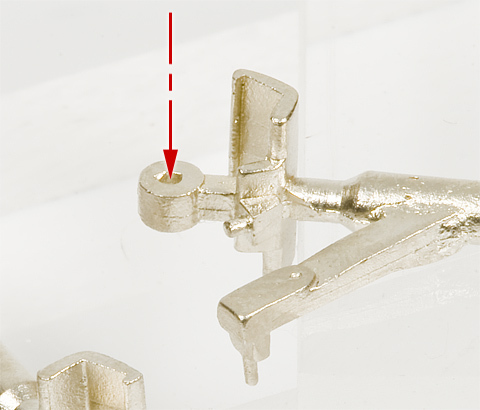 Note: the part is designed to be 0.0005″ larger in diameter than the hole for a light press fit and has a slight taper on the end to help start it in the hole. 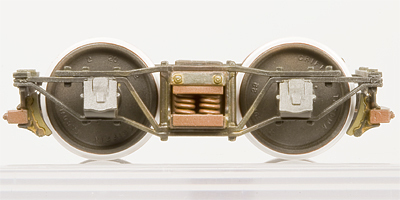 The taper on the inside is meant to help the axle pivot as the truck equalizes. 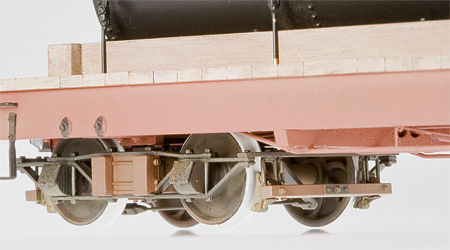 Mock up your wheel sets in the sideframes with the truck bolster in place before you drill out the journals. 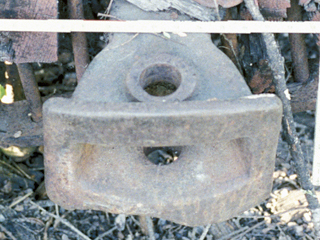 Note the clearance between the journal back and the face of your wheel casting. Some MacLeod trucks will require the thinning of the journal back to accommodate the back flange of the bearing insert. 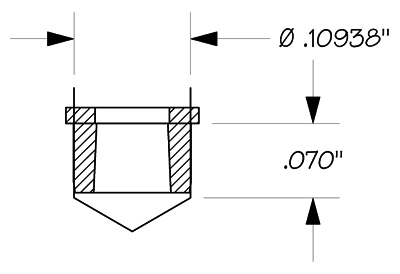 This flange is 0.015″ thick. T-16s are OK, but T-12s and T-17 will require thinning, for example. Not all axle holes are cast perfectly centered on their journals and the journals on some trucks are very narrow (as they are suppose to be). Be careful! 1. 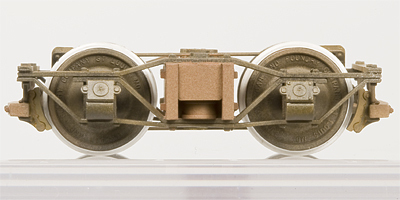 Side Frame as Cast. In this case, a MacLeod Western T-2 sideframe. 2. Journal Back Machined Down 0.015″. 3. Hole Drilled Out Using 7/64″ Drill. 4. Bearing Insert Installed. 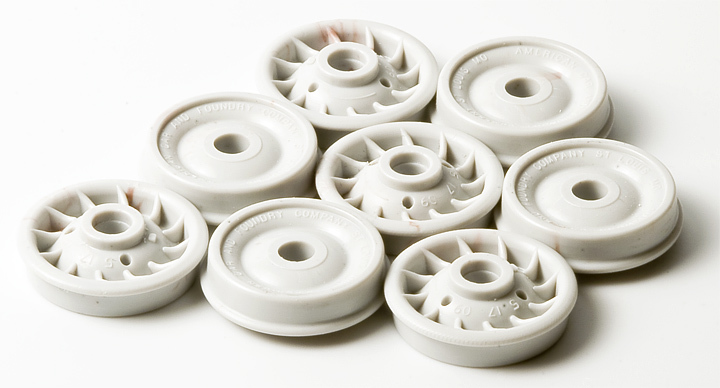 The back flange is only meant to keep the bearing insert from going into the hole too far and to give the wheel casting something to rub against, if necessary. A pretty trim job isn’t necessary. Detail part set includes a set 8, Celcon® bearing inserts, enough to do one car with four, 1/16″ (0.0625″) axles (trucks, wheel sets, and drill bit not included). If you really want to use these inserts, but are affraid to do it yourself, we can do it for you for the prices listed below. This is for new truck kits only. From Left to Right: Standard Kadee® #26 coupler (unmodified), Kadee® #26 w/FMW-4009 Short Extended Knuckle, Kadee® #26 w/FMW-4008 Tall Extended Knuckle, Standard Kadee® #803 coupler (unmodified), and Kadee® #803 w/FMW-4010 Extended Knuckle. 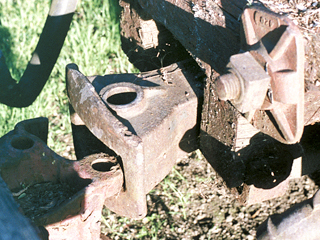 Extended knuckle coupler installed in link & pin draw head on the Robert Dollar shay, Roots of Motive Power, Willits, CA, 5/20/2005. Yes, the draw head IS mounted upside down; No, I don’t know why. It was that way in service. A common complaint we hear from our customers is the fact that they have trouble finding cars whose coupler height matches the very low coupler height of Bachmann’s On30 locomotives and freight cars. (It’s the Bachmann cars that are off, by the way. 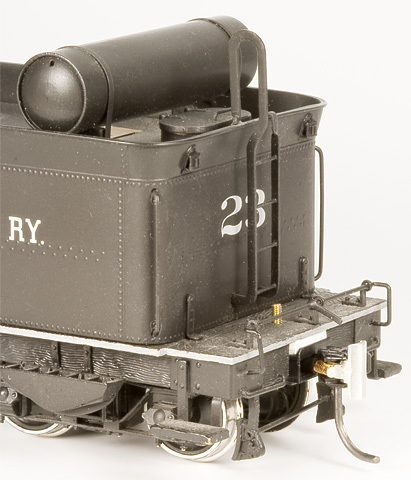 They’re set to NMRA HO standard gauge height, which quite low for O scale.) While this problem can be somewhat alleviated using couplers with offset heads, real railroads found a solution to this problem ages ago: extended knuckles. Oddly enough, there is no “standard” coupler height in prototype railroading in the United States. The F.R.A. rule-book only specifies that there has to be less than a 4″ mismatch in relative coupler height. Remember, prototype cars can have new/old wheels, different trucks, different draft gear, different couplers, and can be empty or fully loaded. All which effect where a coupler ends up relative to the top of the rails. 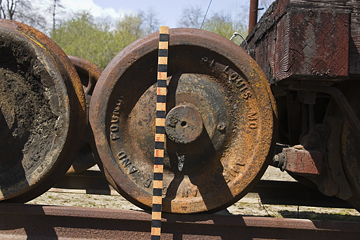 Coupler mismatches were far more common before WWII on standard gauge railroads and was fairly common throughout the history of narrow gauge and industrial railroading; particularly in the logging industry. Bachmann 2-6-6-2 Tender w/Kadee® #27, Medium Shank Underset coupler and FMW-4008 Tall Extended Knuckle installed; coupled to a completed, On3, FMW-2211, Proto-Freelance, 2400 Gal. 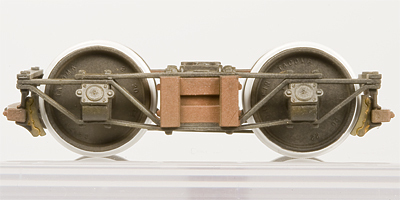 Tank Car Kit (equipped w/factory Kadee® #26, Long Shank Centerset coupler). The tender is near completion on conversion to an On3, Oahu Railway #85 style, oil burning locomotive. Completed, FMW-2219, On3 Coal Car Kit w/Kadee® #26, Long Shank Centerset coupler; coupled to a Wiseman Model Services, On3 Vertical Boiler Shay C.N. #21 (equipped w/factory Kadee® #5, Medium Shank Centerset coupler with FMW-4008 Tall Extended Knuckle and slotted shank modification installed). Key Imports, HO standard gauge, 3 truck, Feather River Shay w/Kadee® #47, Medium Underset Shank coupler with FMW-4009 Short Extended Knuckle. Partially completed, Grandt Line, On3, 18 Ton, 0-4-0 Porter with Tender Kit 93063 w/Kadee® #803, On3 Coupler with FMW-4010 Extended Knuckle and slotted shank modification installed. Sunset, D&RGW C-16, “On3” Gauge, #223 2-8-0, (mid-conversion to oil burner) w/Kadee® #803, On3 Coupler with FMW-4010 Extended Knuckle. The patterns for these parts were made by Dave Squire, an accomplished pattern maker who has done work for PSC and The Back Shop. In fact, if you’ve been around narrow gauge modeling long enough, you probably own some of his excellent work already and don’t even know it! 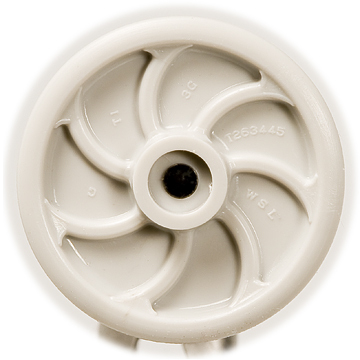 Foothill Model Works is proud to add this incredibly useful part to our line of detail parts. The FMW-4008 Tall Extended Knuckle and the FMW-4009 Short Extended Knuckle were originally designed for the old, “whisker spring” McHenry™ HO couplers, they also work in Kadee®’s line of HO couplers that use the #5 head (i.e. #3, 5, 9-11, 16, 21-29, 31-39, 41-47, & 49), Bachmann® E-Z Mate® HO couplers, and in McHenry™’s current line of coil spring HO couplers. 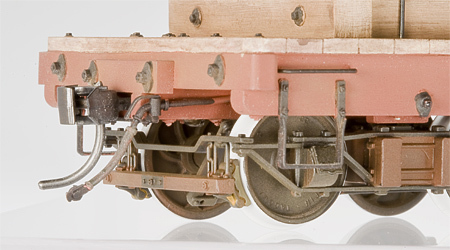 (The pivot area of the knuckle may have to be thinned on modern McHenry™ HO couplers.) The FMW-4008 Tall Extended Knuckle is approximately 0.270″ to 0.280″ tall (a standard Kadee® #5 knuckle is 0.155″ tall) and is best used on O scale equipment or in smaller scales where you have large differences in coupler heights. 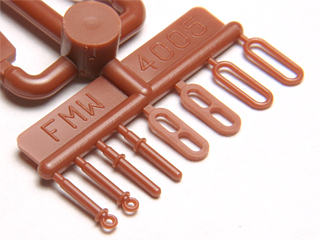 The FMW-4009 Short Extended Knuckle is approximately 0.200″ to 0.205″ tall and is more suited for S or HO scale applications. 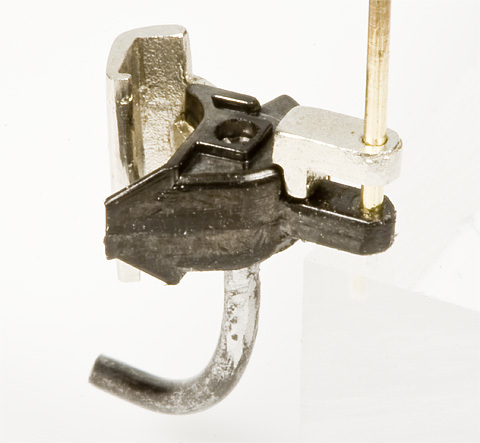 The FMW-4010 Extended Knuckle is designed to fit Kadee®’s #803, On3 coupler. It is approximately 0.300″ to 0.310″ tall (a standard Kadee® #803 knuckle is 0.188″ tall). 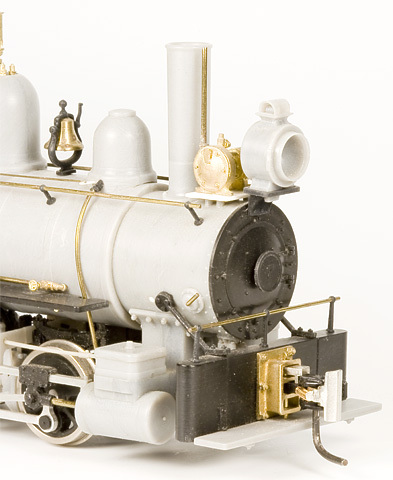 It is ideal for larger O scale narrow gauge equipment like the D&RGW’s large roster of locomotives. These lost wax castings, were cast in “white bronze” (a material similar to brass) that is strong, long wearing, and has a silver color which will allow the exposed areas of the part to look like steel (rather than yellow color of brass). When properly installed, these castings retain all practical benefits of a fully functional Kadee® coupler while offering a simple and prototypical solution to the coupler mismatch problem! 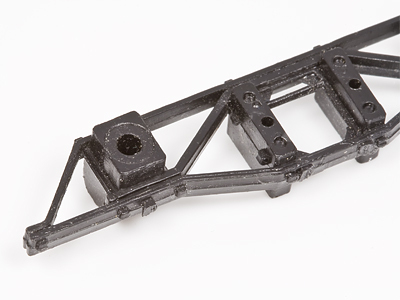 While the prospect of disassembling and reassembling an HO coupler may seem daunting at first; in reality, it really isn’t as hard as it looks. All of these couplers operate in exactly the same way as Kadee®’s #5 style head, so the instructions are essentially the same for all of them. Mostly, it’s the shanks that are different (and, obviously, the overall size, in the case of the #803s). Remove the coiled spring from the side of the knuckle with a pair of tweezers and put it in a safe place. Remove the iron trip pin wire. 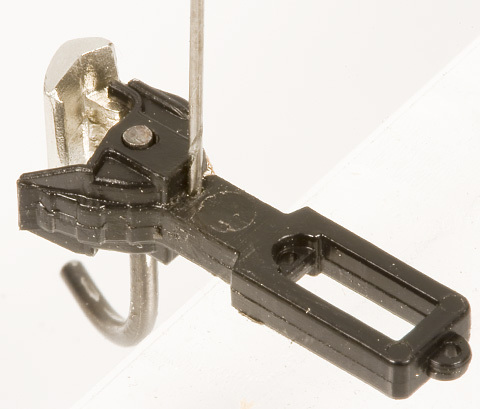 While this can be done with a pair of needle nose pliers, the easiest way is using a wheel puller. Trip pin being removed using wheel puller. Be sure to fully support the head using a plate with a small hole in it. We used an old screw with the pin ground down to about the same diameter as the trip pin wire. Measure your trip pin wire and the drill pivot point hole one drill bit size larger. Always double check your particular trip pin wire, or, if in doubt, start a couple sizes smaller and work your way up. 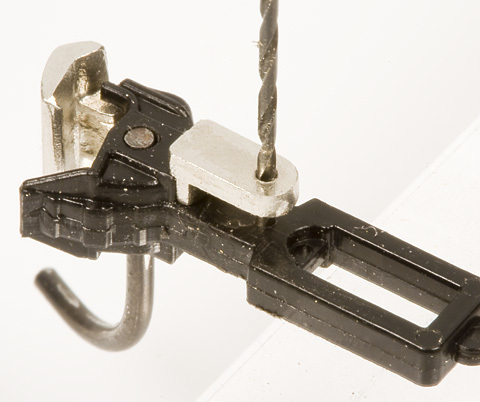 Kadee® uses a 0.040″ iron wire trip pin, so use a #59 drill bit. 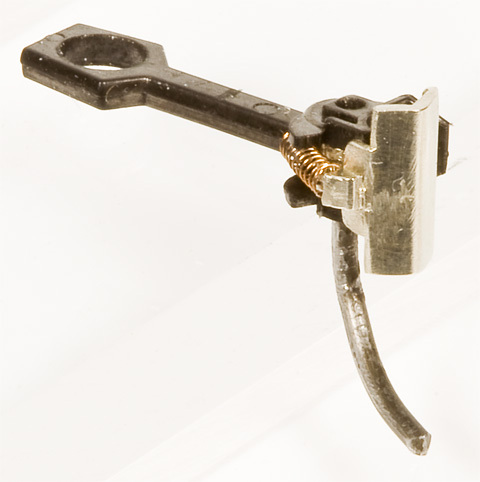 McHenry™ uses a 0.039″ iron wire for a trip pin, so use a #60 drill bit. 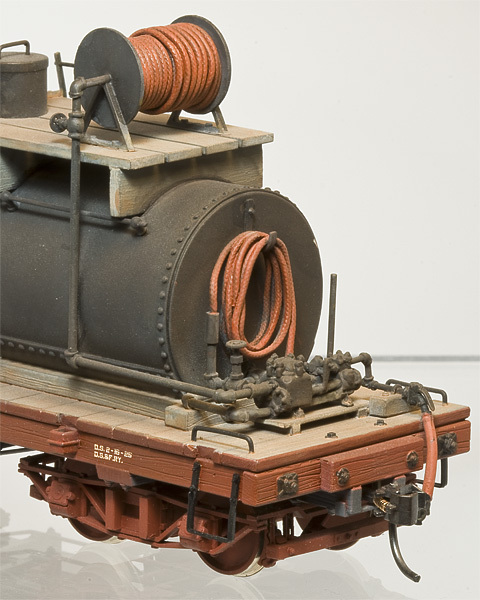 Bachmann® uses a 0.038″ iron wire for a trip pin, so use a #61 drill bit. 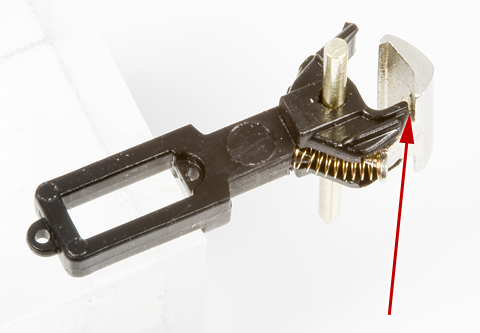 Kadee® uses a 0.045″ to 0.046″ iron wire trip pin, so use a #56 drill bit. Drill pivot point hole here. Test fit knuckle in shank housing. 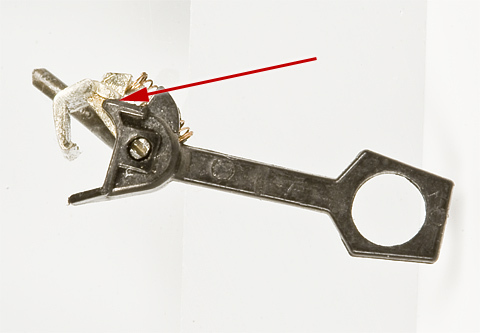 The pivot portion of the knuckle should fit as cast, but might require thinning on some non-Kadee® couplers. The best way to test fit the knuckle in place is to use a scrap piece of brass wire the same size as your trip pin wire to temporarily hold the knuckle in place. Using an unmodified coupler as a guide, check to make sure the knuckle closes all the way. The side of coupler shank housing may need to be shaved with a razor blade or the casting filed down to allow the knuckle to close all the way. The edge(s) that will need to be modified so knuckle closes all the way. Trip pin “ears” that will need filing. 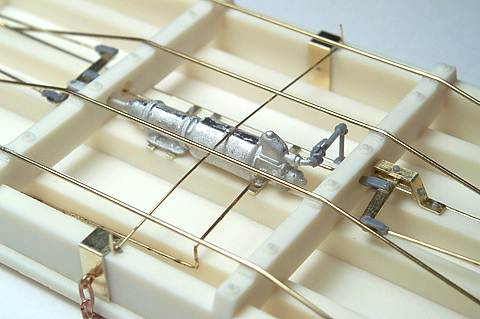 Pliers being used to insert trip pin wire a little bit at a time. Replace coiled spring with a pair of tweezers. Follow Steps 1-5 as above. File or shave using a razor blade, the fillet in the inside corner, between the back of the head and the top of the shank square. File this inside corner square. Drill a hole through the shank, centered on the shank, up against the back of the head, to accommodate the mounting pin for the slotted shank addition. 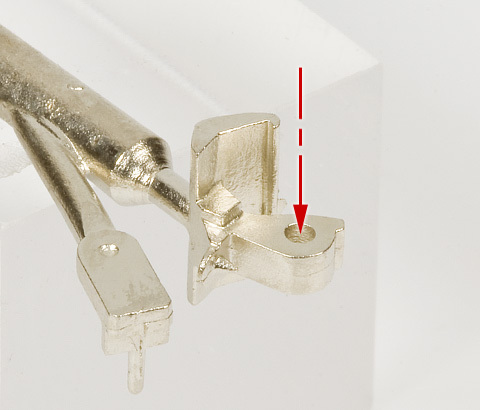 Measure your mounting pin and the drill a hole one drill bit size smaller. It needs to be a press fit! Always double check your particular mounting pin, or, if in doubt, start a couple sizes smaller and work your way up. Use a #77 drill bit. Use a #74 drill bit. Measure the pin used in your slotted, link & pin draw head. Drill one drill bit size larger, through the detent cast into the slotted shank extension casting. Be careful to keep the drill bit square to the part. Remove the slotted shank addition casting from the sprue and file the end to match the curve cast into it. 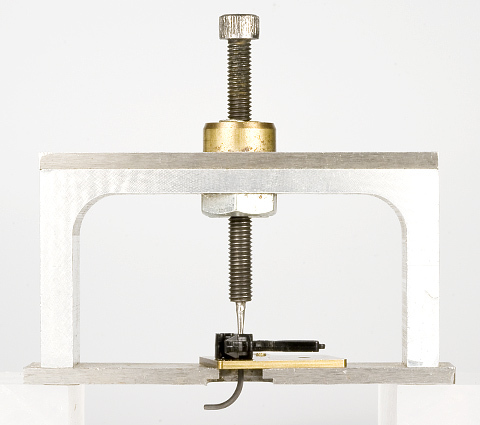 Press the mounting pin on the slotted shank addition casting into the hole drilled through the shank in Step 3. Using the same drill used in Step 4, drill through the center of the shank, through the hole drilled through the slotted shank addition casting. 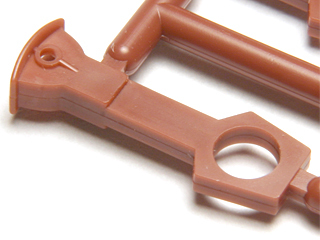 Trim the coupler shank to match the length and shaper of the slotted shank addition casting. 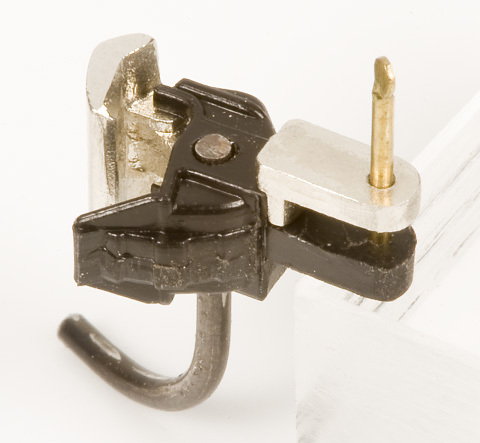 Note: the factory shank on #803 couplers will have to thinned, from the bottom, to fit you particular draw head! 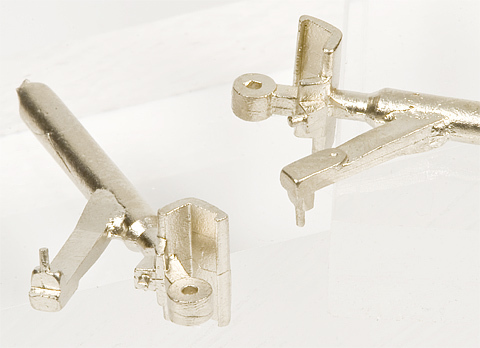 Includes one pair of lost wax, “white bronze,” tall (approximately 0.270″ to 0.280″ tall) extended knuckle castings that can used to convert Kadee® #5 Head, McHenry™ HO Couplers, or Bachmann® E-Z Mate® Mark II HO Couplers. 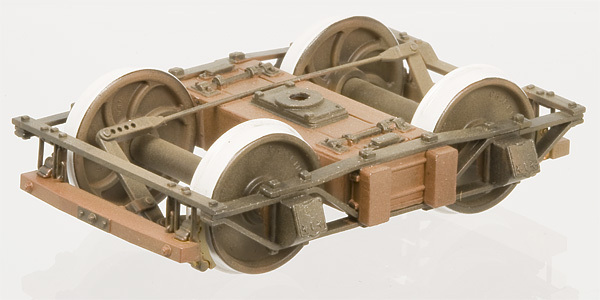 Also included is an optional pair of lost wax, “white bronze” castings to convert a pair of Kadee® style coupler shanks into scale, slotted shanks suitable for mounting in a locomotive, link & pin draw head. 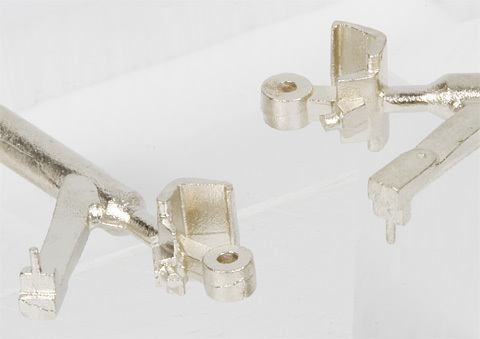 Includes one pair of lost wax, “white bronze,” short (approximately 0.200″ to 0.205″ tall) extended knuckle castings that can used to convert Kadee® #5 Head, McHenry™ HO Couplers, or Bachmann® E-Z Mate® Mark II HO Couplers. 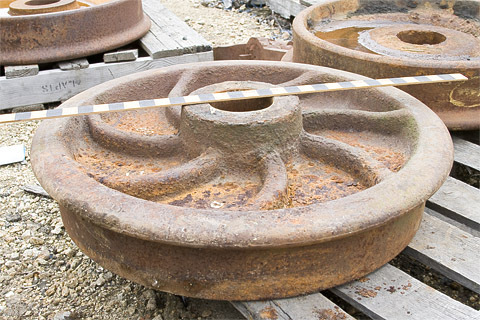 Also included is an optional pair of lost wax, “white bronze” castings to convert a pair of Kadee® style coupler shanks into scale, slotted shanks suitable for mounting in a locomotive, link & pin draw head. 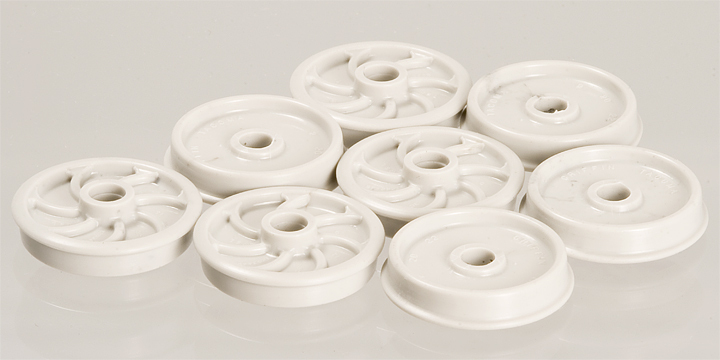 Includes one pair of lost wax, “white bronze,” (approximately 0.300″ to 0.310″ tall) extended knuckle castings that can used to convert Kadee® #803 On3 Couplers. 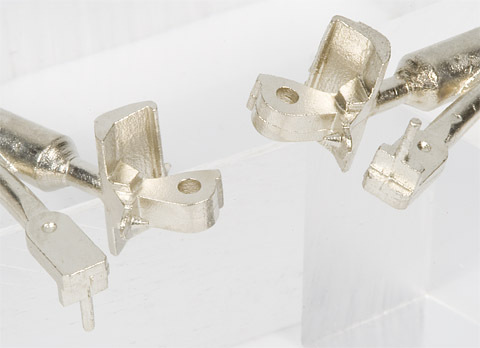 Also included is an optional pair of lost wax, “white bronze” castings to convert a pair of Kadee® style coupler shanks into scale, slotted shanks suitable for mounting in a locomotive, link & pin draw head. Orange FMW-4012 installed on completed prototype model for kit FMW-2212. 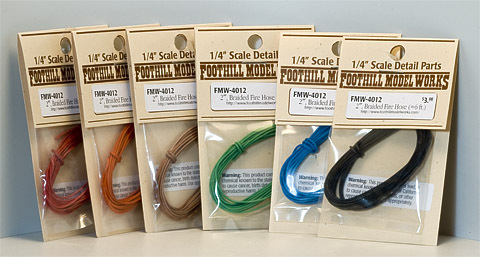 FMW-4012’s in some of the available colors. 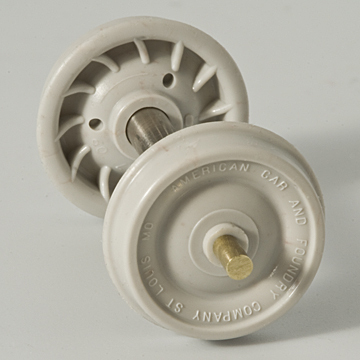 We originally supplied these with our 20′ Fire Car kit. This heavy, lead core trolling line is covered in colored, woven fabric and makes for a very convincing, scale, braided fire hose. Normally available in expensive, 50 yard and longer reels, we’re making it available here in convenient 6′ long lengths. While available in many different colors, it is easily painted to match any color you like. 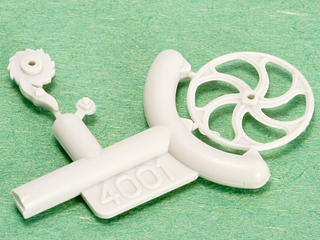 The lead core allowing you to mold the “hose” to any shape. Note: The manufacturer has discontinued this product and only a limited supply is remaining! Don't miss out, order yours today! This product contains lead, a chemical known to the state of California to cause cancer, birth defects, or reproductive harm. Wash hands after use. Use Appropriately. Includes approximately 6′ of braided fire hose, in one of the following colors (Please check on the availability of the color want before ordering). All text, images, and drawings ©2012, 2014, 2016 Foothill Model Works.